These Valentine candy hearts are a fun way to give chocolate with love! I am one of the "room mom's" for my daughter's class, and we always seem to have high aspirations for treats. 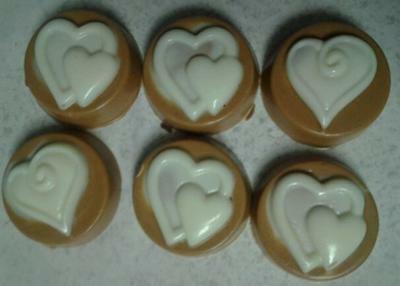 This time around I decided to make some peanut butter cups for my daughter's classroom. I wanted to do something different, which is of course what I always do! 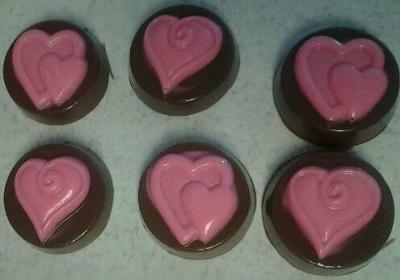 I used a Wilton cookie mold to create some molded Valentine chocolates. I used white chocolate and tinted some of it with pink and blue to make them more exciting for the kiddos. I used the pink and blue chocolate to fill the heart part of the mold. After they were chilled, I coated the rest of the lining of the mold with milk chocolate, but didn't fill it completely. While that layer was cooling I made my peanut butter filling with Jif peanut butter, room temperature butter and powdered sugar. Once the outer part of the molds were set I would take a small amount of the peanut butter mixture and roll it into a ball. Then I set the ball inside the mold and gently pressed it from the center out to fill the cavity. Once evenly pressed out I would then pour chocolate over the peanut butter mixture to cover it and create a seal to the rest of the mold. Gently tap the mold on the counter top to release any air bubbles then place back in the refrigerator or freezer to completely set. Once set, pop them out of the molds and package accordingly. I also made "inside out" peanut butter cups with a peanut butter flavored chocolate and filled them with a chocolate hazelnut filling. To make the hazelnut filling I used Nutella, butter, powdered sugar and added some hazelnut flavoring as the sugar tends to take over the Nutella. These Valentine candy hearts were a huge hit among the kiddos in her class as well as the teachers! Of course the kids preferred the regular peanut butter cups, and the adults were just gushing over the "inside out" hazelnut. I also threw in some solid chocolates that I did similarly but added no fillings (for kids with allergies) then added little candy hearts to the top that were adhered with white chocolate. Ok so you keep showing us these candies on Facebook whenever you make them, when do we get some in person??? These are absolutely gorgeous! I bet they taste awesome too. I am a co-worker that has the privilege of receiving samples. They are delicious. She is always trying new variations for the fillings and they are always the best tasting chocolates I have ever eaten. These treats are wonderful to enjoy at work when the going gets rough!! Just sit back and relax!! These peanut butter cups were delicious! The peanut butter was so creamy, yet the outer layer of chocolate was crunchy. Loved them! Join in and write your own page! It's easy to do. How? Simply click here to return to Valentine's Day Ideas.